Anka Wittenberg is leading the global People Sustainability Department encompassing Diversity & Inclusion and Health. Anka is pivotal change agent on how to design and implement work relationship at SAP in an inclusive environment based on mutual respect, care and trust. She is responsible for the development and implementation of SAP’s Diversity and Inclusion strategy globally, ensuring sustainable business success. Anka joined SAP in August 2011 as global HR Business Partner. In March 2013 she was appointed Chief Diversity & Inclusion Officer. Prior to SAP she gained extensive international HR experience, heading Corporate global HR at Benteler International AG. 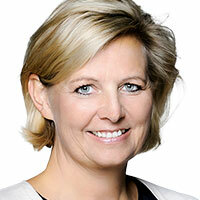 Prior to this, Anka held executive HR positions, leading global teams at various corporate environments. She is member of the supervisory board of Westfalen AG, Germany and Chair of the Board of the World Childhood Foundation Germany. I am thrilled about the opportunities that software technology brings to create a truly inclusive workforce. I love tech because it helps the world run better and improves people’s lives. There are many initiatives: Business beyond bias is a technology-based initiative that eliminates the unconscious bias in the attraction, hiring and developing phase of today’s employees. Accessibility of Software is another huge topic that will have an impact on differently abled individuals to join the workforce.